High capacity IWALK external battery charger is super mini and portable. 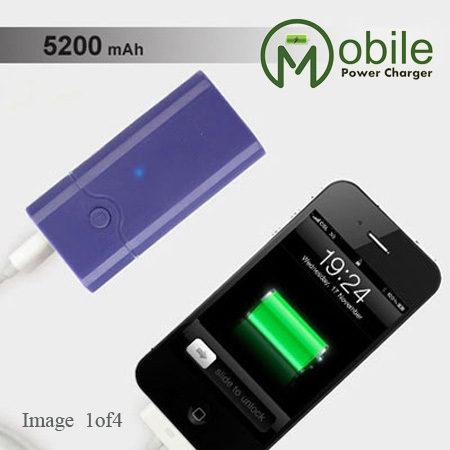 Designed in six bright colors, it can charge your mobile phone, GPS, DV and most other digital products. 5200mAh high performance external battery. Press to show the battery level. Super bright LED flashlight function. Comes with the USB cable and eight connectors. Compatible with most 5V digital products. Available in various colors for you. This super capacity while light weight item will surely satisfy your requirements. Compatible With: iPhone/iPad/PSP/Digital Camera/MP3/MP4/Nokia/HTC/Samsung, etc. The cool Battery charger is an optimal emergency charger for mobile phone,MP3/MP4,camera,IPOD and moreLi-polymer battery cell with high safety and stability.built-in proprietary software to control and regulate temperature,voltage and current. The anxiety of seeing your phone or other device's battery waning low on power is a worry you won't be bothered with again when you're armed with an Power Bank Bar - Style mini lipstick Ultra Capacity USB Power Bank.